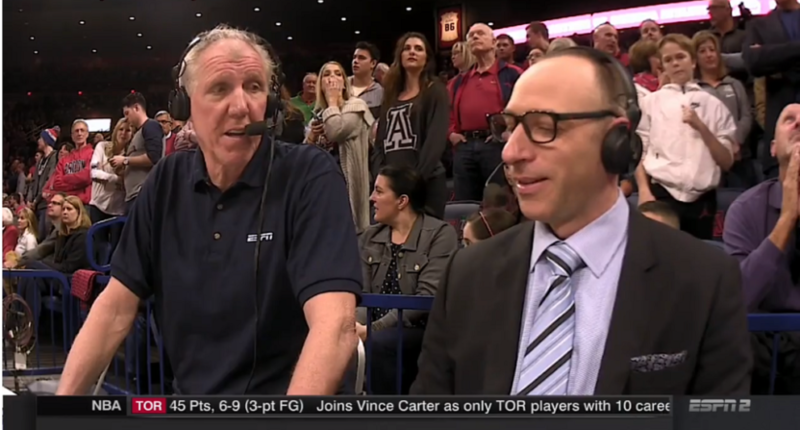 When Bill Walton speaks, it’s very likely that something both hilarious or eye-opening will come out of his mouth. And that was certainly the case on Thursday. Walton and have Pasch were calling the Arizona-Utah basketball game for ESPN, when Walton decided to make elephant noises and talk about adjusting the axial tilt. Naturally. When you look at the broadcast on a much larger scale, however, Walton’s noises are due to his description of Deandre Ayton. The Arizona big man is a top NBA prospect, and according to Walton, it may be due to Ayton’s wildlife characteristics. Okay, let’s run through those, shall we? Runs like a cheetah: That’s an interesting choice for someone who is seven feet tall. If he can run like a cheetah, Ayton should probably consider playing wide receiver at Arizona as well. Soars like an eagle: Yeah, he should definitely look into playing wideout for the Wildcats. Footwork like a mountain goat: I have no words. Vision like a hawk: Seriously, why didn’t Ayton play wide receiver or cornerback? Throws it down like an elephant: I have never seen an elephant dunk a basketball, but sure? Wait, Walton may have something here. Defends like a grizzly bear: Sure, Bill. As a former Bruin, I’ll trust you know about this one. Anyway, the animal talk (and noises) was only part of what made Walton’s broadcast so strange. He also spent some time talking about the axial tilt, again. The axial tilt is a topic of conversation that has actually come up between Walton and Pasch in the past. Outside of comparing Ayton to wildlife and teaching Pasch more about the axial tilt, it was a seemingly normal broadcast for the duo. You know, one that included Walton not knowing what sport plays in the FCS Championship. And of course, one in which a certain type of plant comes up.